1) Georgia Bulldogs [11-1 (7-1)] – Schedules mean something in the SEC and Georgia’s is very favorable. They’ll lose their showdown with South Carolina, but every other game goes in the win column. Their run game will be suspect again with the loss of Isaiah Crowell, but Ken Malcome and Keith Marshall will be enough the loss. Junior quarterback Aaron Murray is also one of the league’s best and the Dawg defense is nasty and will likely be the best unit in the league. 1) Alabama Crimson Tide [11-1 (7-1)] – Don’t hold it against me, but I’m guessing a Tide loss to Arkansas. My real logic is this: I don’t think the Tide goes undefeated this year, but I don’t think they’ll lose to LSU. Make sense? Speaking of LSU, last year I predicted a Tide loss at home to the Tigers mainly because Bama would be sporting a first-year guy at QB. If that reasoning worked last year, it should this year as well. We should know a ton about this year’s team after the first three weeks. Well, whaddya know? The predictions came true – although the details were somewhat suspect, and now #2 Bama and #3 Georgia are set to square off Saturday in the SEC Championship Game. 1) Third-Down Conversions: Can the Tide get off the field against a quite potent Georgia offense? To me, that’s the number one question of this ballgame. It’s not just a matter of how we play on third down, it’s also how we play on the other two. If we’re giving up three or four yards on first down – meaning we’re not stopping the run – and if Georgia consistently faces third-and-threes and third-and-fours, we won’t make it to Miami. Tide defenses under Saban have been known for this: stop the run and wreak havoc on third and long. In our two biggest games this year – LSU and Texas A&M – we had trouble on first and second down and third downs became a nightmare. If the Dawgs convert at similar rates as LSU and A&M – 50.00% and 61.11%, respectively, we won’t win. 2) Turnovers: Against LSU and A&M, our turnover margin was -5. Against the other 10 teams? +19. It should go without saying – though I’m saying it anyway – that in a game of this magnitude, turnovers are critical. The reason for stating the obvious, is that against our two toughest opponents, we gave up the ball easily and couldn’t take it away. I key takeaway against the Aggies or Tigers would’ve gotten our defense off the field the same as a third down stop. 3) Mental Edge: It’s been a long season – 12 games in 13 weeks, plus the off season, and now all the marbles are still on the table. Despite the loss each team endured, all of their goals are still within reach. Everything surrounding this game, including all of the so-called keys to the game, can be wrapped up into who is better prepared mentally for Saturday’s challenge. Is Georgia feeding off of disrespect and the chance to redeem themselves for last year’s beat down at the hands of LSU? 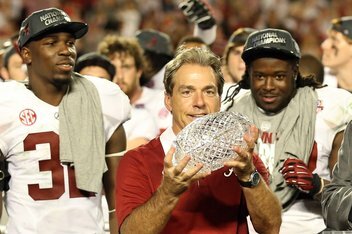 Is Bama still feeding off of the challenge to defend their 2011 national championship? Right now, I’m having a hard time deciding which way this will ultimately go. 14 SEC teams in 2012 and 14 burning questions. Today we look at Georgia. #4 – Will Mark Richt slide back onto the hot seat in 2012? Last year I was on the money concerning Georgia. I picked the Bulldogs to go 10-2 in the regular season – losing the first two and then winning 10 straight. And it happened. A called shot. Dawg fans – and the press – were howling after the 0-2 start and the seat was pretty hot. But 10 wins later, Richt earned himself a contract extension. So it sounds ludicrous, to even mention it, but I will. I think the biggest question concerning the Bulldogs this year is whether or not 2011 was an aberration, and if it was, Richt’s seat could get warm. Why this question and why now? Well, you see, the day before I wrote this piece, UGA sophomore running back Isaiah Crowell was kicked off of the team after being arrested. Yes, I know the Dawgs have a few running backs besides Crowell, including all-world recruit Keith Marshall. I know, I know. Boys will be boys and with that comes the occasional arrest after being stopped at a check point at 3:00 a.m. in the morning. But despite Richt being one of my favorite coaches, I get the feeling that things aren’t all right in Athens. When teams are this close to a national title, you expect a little more intensity from the program. You expect the players to tow the line. You expect some self-policing. Instead, with the Dawgs, you need a program to keep up with the suspensions. Bulldog defenders Baccari Rambo, Alec Ogletree and Branden Smith are each facing suspensions to start the 2012 season. So while we could be discussing Aaron Murray and whether or not he’s the best quarterback in the league (he’ll be a third year starter and he’s only a junior!) or if the Bulldog defense could possibly be the best unit n the league, instead we’re left to scratch our heads and wonder when we’ll hear about the next stupid Bulldog trick. This team’s only real weakness is an inexperienced offensive line and the schedule is very manageable. This could be a very special season for the Bulldogs, but I’m wondering if they have the leadership and character to pull it off. When it comes to the world of college football recruiting, SEC members Florida and Georgia can often look down their noses at other members’ recruiting practices. UGA coach Mark Richt is going to church on Wednesday with the state of Georgia’s top uncommitted prospect, Josh Harvey-Clemons. Richt’s church visit will count as his in-home visit with the 6-foot-5, 200-pound linebacker from Lowndes High School. Harvey-Clemons has UGA, Florida and Florida State in a three-way tie and will announce his decision on National Signing Day (Feb 1.). Richt, who is known for his Christian beliefs, won’t be the first college coach to attend church services with Harvey-Clemons at a small Baptist church in the Clyattville area of Lowndes County. “[Will Muschamp] came to our regular service about a month ago; I guess Coach Richt doesn’t want to let Coach Muschamp beat him out with going to church with us,” said Josh’s grandfather, Woodrow Clemons, with a laugh. I’m sure they were, Mr. Clemons, I’m sure they were. So #UGA athletics made $52M profit in 2010 and couldn't give its recruiting asst a $10K raise? Seriously? If Auburn’s coach had been busted for such “generosity and compassion,” the Dawgs would be screaming hush money. Clearly the most intriguing findings were those that detailed Richt’s under-the-table payments to staff when the previous administration refused his requests. Not only does it illustrate Richt’s determination to do what he perceived as right for his staff members, it offers a glimpse into the dynamics of the relationship between Richt and former AD Damon Evans. I’ll admit that I like Mark Richt. I hope he continues to be successful at Georgia and coaches there for a long time. But it has been fairly entertaining to watch Bulldog fans react to this situation. There’s a fair percentage of UGA fans that think their school can do no wrong, and if it does something wrong, it’s for the right reasons so it must be okay, and by the way Nick Saban is the devil. You know the type fan I’m talking about. I can think of two similar “we can do no wrong” programs that have been in the news the past few months. Very impressed by Mark Richt's halftime adjustments. ** Georgia came out with guns blazing and outplayed LSU for 30 minutes, but only had a three point lead at halftime to show for it. ** A couple of plays cost Georgia a 21-0 lead. Would that have been too big of a hole for the Tigers? I kind of doubt it, but it would have made for a more interesting second half. ** Love him or hate him, but Tyrann Matthieu is the real deal. This kid is the obvious Heisman front runner for 2012. ** If there was any doubt about LSU’s quarterback it was answered yesterday. Jordan Jefferson struggled through a horrible first half, but Les Miles didn’t flinch and go for his bullpen. That’s kind of a tough deal for Jarrett Lee who carried the Tigers through the first part of the season, but Miles is apparently dead set on Jefferson. ** Kenny Hilliard is a hoss. ** Georgia’s running game is horrible and until that improves they can forget about conference titles. All season we’ve heard how Isaiah Crowell can’t block (which may be the least of his troubles). The Dawgs have this backwards. They need to pound folks with the running game and then follow with the pass. When defenses start respecting Crowell, and their running game in general, it will take the pressure of his pass blocking assignments. ** Aaron Murray was victimized by at least five dropped passes in the first half, including an easy touchdown catch by Malcolm Mitchell. But his ball protection skills hurt the Dawgs yesterday, just like in the loss to South Carolina. ** As I said before, I wouldn’t have been upset with an LSU loss, but the better team definitely won. Congratulations, Tigers. It’s getting late in the week so I decided to post a few thoughts on tomorrow’s SEC championship game between LSU and Georgia. ** If LSU and Georgia each play their best games, LSU wins going away. But that doesn’t always happen. That means Georgia does have a chance and LSU’s state of mind heading into this game matters. ** Georgia has tried to play the disrespect card all week. It’ll be interesting how that works out for them. LSU, meanwhile, has been fairly workmanlike this year as they’ve played through several tough situations. I would expect that workmanlike attitude to serve them well tomorrow. ** Georgia is very similar to Arkansas in that they have a very good passing game and adequate running game, but the similarities end there. The Dawgs have a much better defense. UGA doesn’t need to play a perfect game – either on offense or defense – but they will have to play at a very high level for 60 minutes. They can have turnovers, but they can’t be the back-breaking kind. They don’t have to dominate running the ball, but they’ll need to be able to run some. ** On the other hand, I really don’t think Georgia can run the ball on LSU, so the game will probably come down to Aaron Murray and his receivers versus the LSU secondary. As good as Murray is, I think that match up favors LSU. ** Defensively, Georgia plays a 3-4 similar to Alabama. It’ll be interesting to see how LSU attacks. They have the ability to run inside with their stable of backs, or run outside with Jordan Jefferson running the option. ** Jarrett Lee threw two interceptions against Alabama and found himself on the sideline. Jefferson only went deep a couple of times against the Tide, so it’ll be interesting to see how Reuben Randle and Russell Shepard are used. Georgia’s secondary isn’t as good as Alabama’s so LSU may try the deep ball via Jefferson more often. From an Alabama perspective, it’s better if the Tigers pound the Dawgs. Personally, though, I won’t be upset if the Dawgs pull out a win. Maybe so, Sanders. Maybe so. However, the statistics don’t seem to agree with you: Alabama has the conference’s second-best yard per game average at 433.40, while the Dawgs average 423.70 per game. The Tide also scores 36.0 per game, good for third in the SEC, while UGA averages 34.0. The Dawgs have, as the pundits are saying, a “puncher’s chance,” and I actually think they will play well. But to do that Murray better be “on” and they’ll need to muster some way to run the ball.